Technologies are now in place, the use-cases and solutions need to be built. ABR streaming formats are settled : HLS and DASH are now standard, used by the entire market to deliver their content. AR/VR were not trends, the technology is here, but for now, the disruptive business case is not yet available on the market. The only topic which is on-going is related to AV1: the new video codec. The bitstream was freezed in March this year. The companies and working groups are now working on the improvement for encoding and decoding. We should see major release during the next NAB in 2019 and very probably from Bitmovin who is one of the AV1 major contributor. Every big sport event comes with their challenge. This year for World Cup in Russia, the CDNs were heavily used. At the same time, the content providers started to use in production Peer-to-Peer solution. The goal was to improve the delivery and reduce (or ratain) the CDN pressure (and by consequence the CDN bill) for those content providers. Others companies (like EasyBroadcast) are also providing P2P solution, but they are more confidential for the moment. 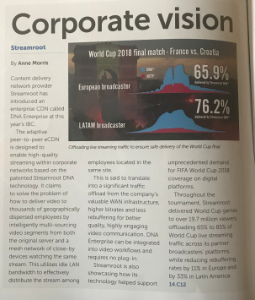 Content providers still need CDN (as source) for their content, but for large scale event, P2P solution provider are / will be more and more used. Interestingly, P2P solution are suffering when the internal ISP network is not really good (keeping in mind WebRTC is using UDP and not TCP for transport). India is currently a good example. Wowza Media Systems Co-Founder David Stubenvoll on Battling Latency on the Company’s Legacy is probably a good start to understand the current situation to stream low latency. If you do not know CMAF, Bitmovin is providing a great explanation of CMAF. One of the main goal would be at the end to have HLS (TS chunks) and DASH (MP4 chunks) using the same chunks format, only the manifests will be different (M3U8 for HLS, MPD for DASH). Also CMAF would solve the low latency problem (when sub-seconds chunks are required).